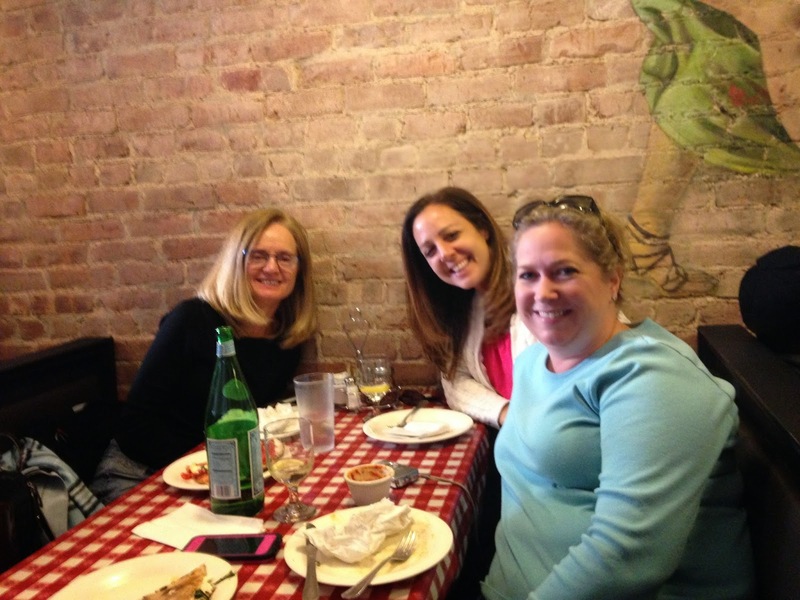 While we were in New York we ate at Lombardi's pizza. Sitting in the heart of Little Italy, it claims to be the oldest pizza shop in New York City. Any pizza place that's been in business since 1905 has got to be doing something right. Who better to test out this legendary pizza joint than three girls from Georgia? Turns out, they really do know how to make an incredible pie. Every pizza that they make has their own homemade sauce, fresh mozzarella and gets cooked in a coal oven. It is delicious. We ordered a "small" pizza with sliced tomatoes and fire roasted red peppers. Simple and delicious. That's all I can say about that. I figure that if I make a couple hundred pizzas a day for the rest of my life, my pizza might eventually be as well perfected as Lombardis. It really was yummy so I thought instead of competing with greatness, I would try something new with my pizza dough this week. I made cheesy bread. I used a slightly different dough recipe that I found on laurenslatest.com. Considering the fact that I don't have a giant coal oven that reaches temperatures over 500 degrees, I think it turned out pretty great. For the pizza dough--In a large mixing bowl, preferably that of a stand mixer, stir yeast and sugar into warm water. Sit for 5-10 minutes or until bubbles form and mixture starts to foam. Pour in salt, oil and half the flour and mix. Once that flour is incorporated, start adding flour in bit by bit until you get the pizza dough to the consistency you want: slightly tacky, but when you touch it it doesn't stick to your hands. Knead 6 minutes. Lightly grease a bowl & the dough so it doesn't dry out, cover with plastic wrap and let it rise 1-2 hours. I love to see the smoke coming out of the top of the Egg. Combine butter and garlic and brush over crust. Bake 15 minutes or until cheese browns on top. It's not Lombardi's pizza but it was still pretty good. The kids really liked this so I think I'm going to make another cheesy bread pizza again soon. More New York pictures coming tomorrow!